Most surveillance system owners want a convenient way to view the live video from their security cameras on a TV. Apple TV and Google Chromecast provide an convenient wireless alternative to hard wiring a spot monitor output from a DVR. This article will compare using a spot monitor output to mirroring using mobile apps to view video surveillance on a TV. The traditional way to setup security camera viewing on a TV (when a DVR is used) is to connect the spot monitor output of the DVR to one of the analog video inputs of the TV monitor. Analog video inputs on TV sets typically use an RCA type input. 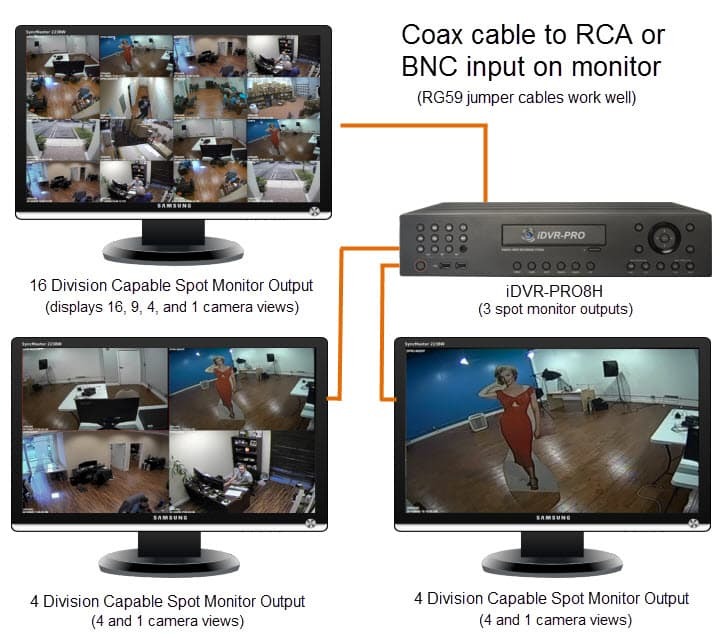 A coaxial cable is run from the BNC spot output of the DVR to the RCA video input of the TV. When the user wants to see their cameras, they simply switch the TV to the video input that the spot monitor is connected to. This is a very convenient method for viewing, but sometimes no so convenient to setup because running the coax cable is difficult or not possible at all. Below is a diagram that shows a DVR with multiple spot monitor outputs connected to multiple TVs. You can learn more about spot monitor setup here and you can see a demo video and additional wiring diagrams here. If your surveillance system includes an iOS app to access your DVR, you can use Apple TV to view your cameras. The iPhone and Apple TV are connected to the same network via a wireless router. The Apple TV is connected to the TV using an HDMI cable. The video input of the Apple TV is selected using the TV’s remote control. The DVR viewer app is started on the iPhone (or iPad). AirPlay is enabled on the phone in mirror mode. As you navigate the app on your iOS device, everything that you do is mirrored on the TV. You can find detailed setup instructions on setting up Airplay mirroring here. Watch this video to see Airplay mirroring on Apple TV being used to view security cameras connected to an iDVR CCTV DVR. If you are an Android user, Google Chromecast provides the same mirroring functionality that Apple TV does using the Chromecast app. The Android phone and Google Chromecast are connected to the same network via a wireless router. The Chromecast is connected to the TV using an HDMI cable. The video input of the Chromecast is selected using the TV’s remote control. The DVR viewer app is started on the phone. The Chromecast app is running on the phone and cast screen is enabled. Everything that you do on your Android is now cast (mirrored) on your TV. You can find detailed information about setting up the cast screen feature of Chromecast here. Watch this video to see Google Chromecast being used to view surveillance cameras connected to an iDVR-PRO CCTV DVR. Can Apple TV or Chromecast View Cameras Remotely? A few days after writing this article, I received an email from a reader who asked the following question. I was wondering if you could make this work if you had CCTV cameras at a vacation lake house and wanted to view the video on TV from a remote location? Here is the information that I supplied to this reader. Yes. Because Chromecast or Apple TV is mirroring on your TV whatever is happening on your Android or iOS device, it does not matter if the app is displaying video from cameras that are local to the same network that you are on or if you are accessing a surveillance system from remotely over the Internet. As long as port forwarding is setup properly where your system is located and you can access your cameras from a viewer app, it will work fine. 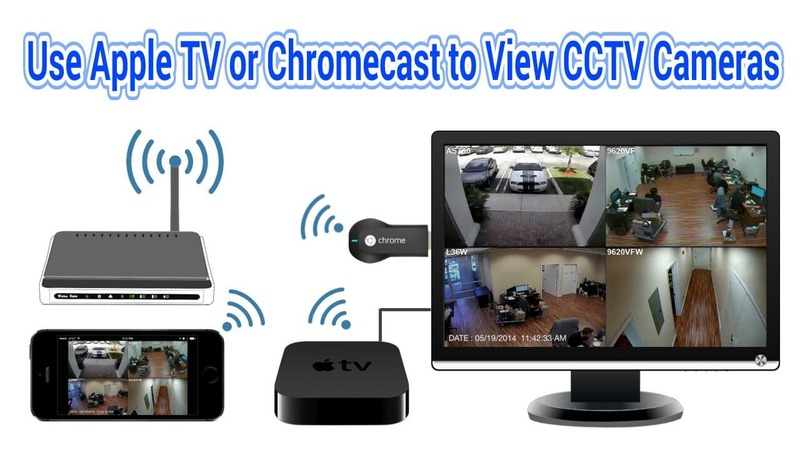 If you want to view your security cameras on your TV and are unable to run coaxial cable, Chromecast and Apple TV provide a great alternative traditional hard wired spot monitor installations. The downside is that there are many more steps involved in accessing the video stream on your TV when using these devices. With a hard wired DVR spot monitor output, all you need to do is switch the video input on your TV using the TV’s remote and the view from your cameras are there. If you are using a mobile app with Apple TV or Chromecast, you need to start up the app, enable mirroring, and switch the TV’s video input. Also, the process of connecting to your DVR in the mobile app most likely requires multiple steps also. In the end, it is a trade-off. Using apps and mirroring requires very little upfront installation work, but requires more steps to access the video. The hard wired spot monitor setup is a more intensive installation upfront (because of the need to run cable), but is super convenient to access your cameras when the install is complete. One last thing that I should mention. DVR spot monitor outputs only display a live video. Being that both Apple TV and Chromecast are mirroring exactly what is happening on your mobile device, you can also perform recorded video search and playback on your TV. You can also switch between camera views, so if you want to go from a single camera view to a grid of multiple cameras, you can do that as long as the app supports it.